A.J. 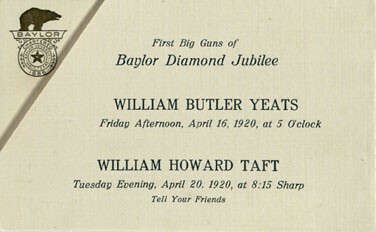 Armstrong secured many renowned authors, politicians, explorers, and more, to visit Baylor. (See blogs.baylor.edu/armstrongbrowning to read more.) The Armstrong papers document some of his efforts to bring these speakers to Waco, among his many other activities. Andrew Joseph (A.J.) Armstrong papers: The Andrew Joseph Armstrong papers consist of correspondence, literary productions, and other materials collected during his tenure as Chairman of the English Department at Baylor University. His wife Mary’s genealogical records comprise the final series of the collection. Francisco Banda papers: Papers regarding Francisco Banda in relation to a 1922 conflict with his landlord, Clark Herring. Texas governor Pat Neff was asked to intercede. Baptist Missionary Publications: Indians of North America collection: This collection contains religious and educational publications in American Indian languages, most of which were translated and printed by Baptist missionaries in the Midwest. Bryan First United Methodist Church records: The Bryan First Methodist Church Records, 1903-06, consists of documents created by members of Bryan First Methodist Church (now First United Methodist Church of Bryan). The papers contain meeting minutes, financial ledgers, and attendance records. Charles and Lucy Exall Chaplin papers: The Charles and Lucy Exall Chaplin papers contain literary scrapbooks, and photographs pertaining to the Chaplin and Exall families in Texas. The papers document the lives of important Baptist leaders in Texas during Reconstruction, and the family’s service at several important churches around the state. 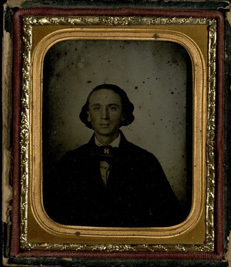 The Chaplin papers contain many photographs of family members around the time of the American Civil War, including this one of Charles Exall in 1861-1862. Royston C. Crane collection: The Royston C. Crane collection contains personal and family correspondence, financial documents, legal documents, literary productions, and photographic materials belonging to Royston C. Crane, the son of former Baylor University President William Carey Crane. William Maury Darst papers: The William Maury Darst papers consist of manuscripts collected from 1894-1973. These papers contain literary productions and photographic materials, with essays, notes, slides, and other printed materials, reflecting his historical research interests and medical work in Texas. Daughters of the American Revolution: Elizabeth Gordon Bradley Chapter records: The [Waco] Daughters of the American Revolution: Elizabeth Gordon Bradley Chapter Collection contains materials concerning the organization’s activities in the McLennan County area. These include minutes, scrapbooks, video tapes, yearbooks, programs, clippings, handbooks, and directories. Tracy Early collection: The Tracy Early collection contains professional and personal materials pertaining to newspaper and magazine articles written by Early, including correspondence, diaries, photographs, school work, books, and sermons. A reunion of friends in Independence, Texas. The Royston C. Crane papers include a good deal of genealogical work on the extended Crane family and historical research on Baylor's early days. Kate Harrison Friend papers: The Kate Harrison Friend Papers consists of correspondence, literary manuscripts, scrapbooks, and photographs. 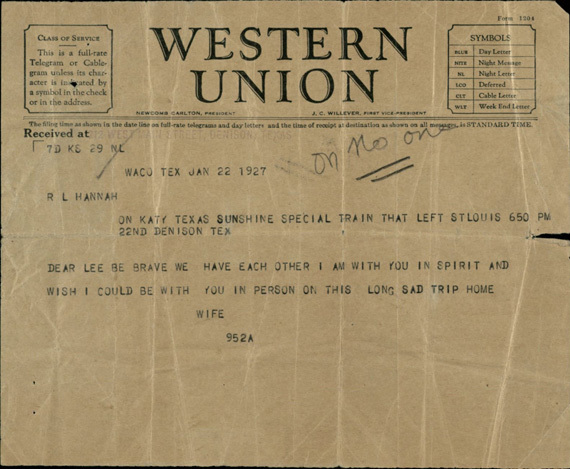 The majority of the letters were to Kate Harrison Friend, philanthropist of Waco. McLennan Family collection: The McLennan Family Collection consists of correspondence, legal, financial, literary, and photographic materials. This collection focuses on Neil McLennan, namesake of McLennan County. Ben Milam papers: One letter from Ben Milam to Richard Pryor regarding the settling of Texas. Rotan (Edward and Kate Sturm McCall) papers: The Rotan Papers contain literary productions, correspondence, photographs, clippings, and a ledger book. 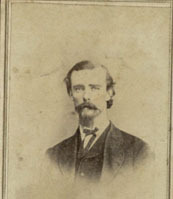 Edward served in the Civil War, then became a business leader in the Waco community as president of First National Bank, among other positions. Kate was very active in various civic organizations and helped establish Waco’s first public library. John Kern Strecker papers: The John Kern Strecker Papers consist of correspondence, financial documents, literary productions, and a photograph. Strecker was curator of Baylor’s museum, which was named the Strecker Museum in his honor. You can see how wide and varied The Texas Collection’s holdings are! These records—and the finding aids we have online—are just a small representation of the thousands of collections we preserve for future researchers. We’re working hard to make our collections more visible and hope that one of them will spark your interest!